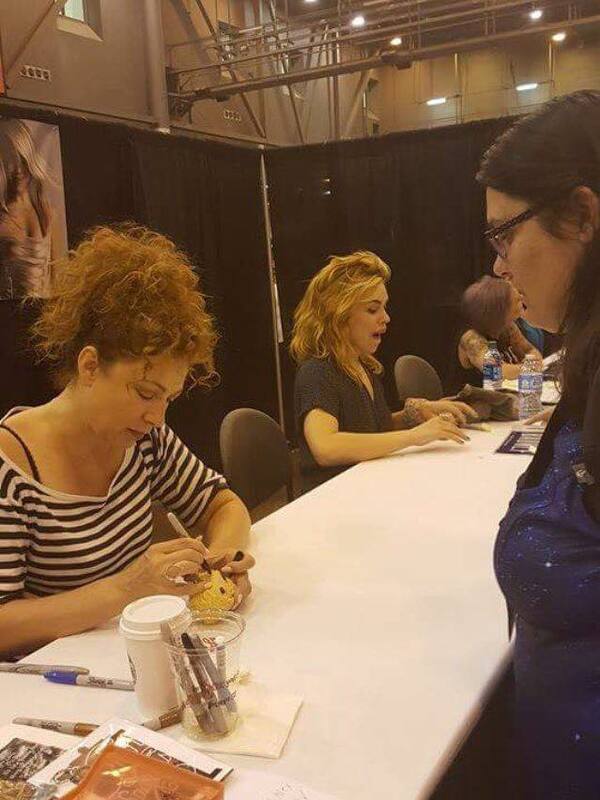 This entry was posted in Conventions and tagged Alex Kingston, Billie Piper, Doctor Who, Space City Comic Con, Star Trek, William Shatner by Mike Glyer. Bookmark the permalink. The Joseph Bayer issue has been making the rounds on various convention artist groups, I’m glad the staff did something about it. It’s a shame when people do stuff like that, because it’s clear that he does have some skills with the filters and making things look nicely grungey and could explore that to create some decent original art (or just proper fanart in the splatter style), but some people want to treat the artist alley as a source of “easy” cash (ha ha yeah right, easy) and will try to find a trick to churn out popular art fast. And man, that Charlie Hunnam situation suuucks. I hope people are refunded! I sent my 3 kids (22, 16, 12) without me because I had another obligation, but they were SO excited! We had prepaid for several autographs, and they were texting me from Houston right away, panicked because it was suddenly cash-only (for SOA and Star Trek) and they were not prepared. Thankfully, I was able to shuffle funds into my daughter’s account so she could hit the ATM, but cash prices were MUCH higher than pre-prices, and now we are out BOTH costs with no knowledge of refunds. It’s all quite unfortunate, but in the end, the kids had a fantastic time…the stars were all very friendly, chatty, and my 16 year old got to meet Sam Jones and shake his hand…a particular thrill because she did not know he was going to be there. My husband and I bought 3 day passes and did not attend for SOA. We certainly didn’t leave happy though. Every single panel we attended had problems. Either there are no microphones, celebrities were not in attendance or they started very late. Several times, they forgot to inform celebrities of their panel times. They changed the times/locations of the panels so we missed some we wanted to see. Funny thing was, the changes would be posted some places but not others. The stars we wanted to see at the star trek 50th reunion panel did not attend Sunday. Brent Spider’s panel was also canceled. It was a very frustrating weekend. @Minette Bryant – I really hope you get refunded in the end! “Fandom Galaxy recently acquired the social media no longer in-use by the previous company, its shows, or its promoter. We are a new venture from out of state, drawn to Texas because of the legendary hospitality and warmth of Texans. We saw an opportunity and began to make a changeover from old ownership. Facebook requires that a page become active as the name is changed, which happened yesterday. At this point, there is no event date or news, because those things are still in planning stages. There is no longer a “Space City Comic Con”. Any chances that it may have had, to fulfill obligations, were removed by the betrayal from within of a shareholder who made a hostile takeover under false pretenses and the one-sided settlement of a unjust lawsuit that bled out that company even as its competitor tried to seize its lists of vendors, clients, agents, and contacts. There is no re-brand. No rename. No “new look”. Fandom Galaxy saw potential and seized the opportunity. We saw fans and vendors who were now without a show they had supported and enjoyed over 6 events. We did not acquire this to repeat the past, but to begin something new – and after all, the social media was strong and already in place! They took their name off, we acquired the social media (NOT the name), and made it all our own, as a starting point to get to know the fandom. We’ve gotten some great messages and comments, and we’ve also gotten some very ugly people posting with ZERO information about us, looking for a place to spew their bile which is directed at someone else. We’d appreciate the opportunity to get to know all of you — ALL of you!! — before we are judged, as we’ve done nothing as yet besides take down the “old signage” and put up our “new owners” logo. We look forward to the lively dialogue of every type of fandom, here on our page. For those who prefer to begin to meet us with negative comments, we won’t hesitate to block you and remove your comments. It’s our page and our right. We’d rather get to know you for the first time, and you get to know us–or at least give us a chance to do our first events and then critique us? For those who belong to “our tribes” and are gamers, cosplayers, nerds, geeks, comic book fans, fangroups, artists, craftspeople, vendors, entertainers…the list goes on and on… we want to meet you, talk to you, find out if there is a place in your fandom for us, and if there are niches which need a little more attention. They are engaging a bit with fans in the comments, but are thus far ignoring all comments asking for more information about THEM. More and more folks are asking who they are, like actual names of people and/or corporate entity name, where they’re from ‘out of state,’ etc., and are being met with silence. Has he never MET fans? Sheesh!